Imagine yourself a pirate? Have we got the adventure for you! Climb aboard the Sea Dragon and let the crew take you on an old-fashioned swashbuckling adventure through the back bays of OC. 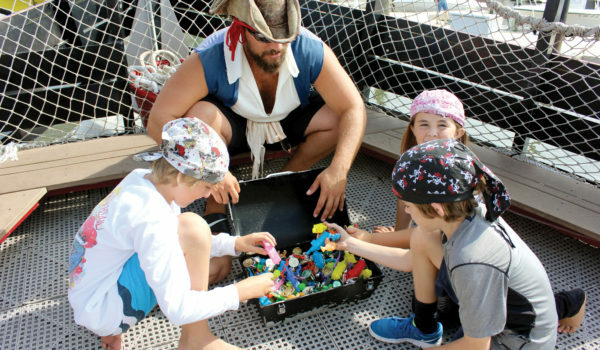 Face painting, storytelling and fun – you never know when you might have to fire up the 16 water-cannons to defend the ship. Bring a camera. Online booking available. 9:30am, 11am, 12:30pm, 2pm, 3:30pm, and 5pm. Also an evening trip at 6:30pm. Reservations required. On Bay Avenue between 2nd and 3rd Street. Find them at 232 Bay Avenue, Ocean City • (609) 398-7555 • piratevoyages.com.